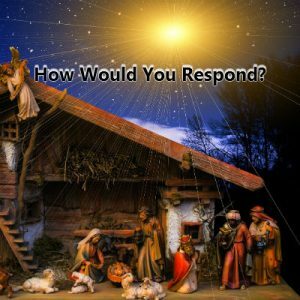 Home > Blog > Uncategorized > How would you respond? Struggling to keep Christ at the center of our Christmas celebration? The lure of materialism and all shiny things is real. The heart, quite literally, was behind the birth of Christ. Emmanuel-God with us; God came near. The Creator became the created to deal with our hearts. We had, have, and will have a sin problem and no way to solve it on our own. It would take a Savior to save us (his people), not from political issues, economic problems, race questions, relational divisions and so forth. The root of it all is SIN. It is what separated the creation from its Creator, as recorded in Genesis. We have walked farther and farther away from God. No wonder so many feel an emptiness, a void that they try to fill any way they can to no avail. The void is the gap we have created through our choices in life. It can only be filled by the Creator and He sent His Son as the perfect fit. The solution has been provided, yet we have to apply it or accept it for it to do any good in our lives. However, it came and it comes with a cost. This cost God His Son to hang on a cruel cross and it will cost us too. We must give up ourselves (our wants, desires, plans, celebrations) and become more like Christ. His agenda becoming our agenda-his plans and purpose becoming our plans and purposes. His will becoming our will. When we become more like Jesus, we celebrate Christmas every day, not just in December 25 . God with us! Emmanuel. Do we show it through the way we live each and every day? Is God really with us or just in word, when it’s convenient?